We know that family support is an integral part of a student’s success. Beyond the quality educational opportunities for which we are known, Misericordia University offers various cultural events and social opportunities for our students, alumni, parents of students, friends and neighbors. This webpage is designed to keep you informed about MU and present various resources you may find helpful during your student's college experience. Community Resources - Places to Stay, Dine, and More! There are several local businesses that surround the Misericordia campus. Below is a list of these businesses. Misericordia University has several social media sites which are an easy way to stay connected with MU! Below are the links to the Facebook, Twitter, YouTube, and Flickr accounts! There are important events and news that occur at Misericordia University. The following links can be used to keep up with these events! 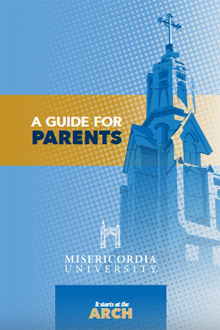 Misericordia has certain resources that are important for parents throughout the amount of time your student attends Misericordia. Your student's academic achievement is important to Misericordia University. Here are some important links regarding Misericordia University's academics. Misericordia has certain programs and offices that are important and interesting to the students on this campus. Here are some important dates to remember for the Fall 2018 Semester. Misericordia University has multiple newsletters that keep the Misericordia community up to date on current and exciting news occurring throughout campus. These newsletters are open to the public for subscription. The Highlander is a student run newspaper that discusses new happenings on campus and important student issues. It is available online as well as in print. -Look for the box on the left hand side titled "Email Updates"
Misericordia Athletics also has a newsletter that provides the latest updates on sports events and highlights from recent games. Misericordia Today is the university's official Alumni Magazine published twice throughout the year. The magazine highlights specific events regarding both past and current happenings on campus and among the Misericordia community. Click here to access an archive of both traditional and digital versions of the MU Today magazine.